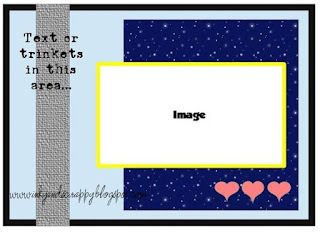 I am back with the new challenge over at Crafty Creations Challenges. This one is a sketch challenge. Feel free to flip it, but make sure we can still see it in your work. We are sponsored by the lovely SLS Lines for our first new challenge of the new year! I have used two of their lovely images in two separate cards for this challenge. I'm using up some old 6x6 pads to start off the new year... patterned papers are from Basic Grey. Solids are CTMH cardstock. Inks are CTMH, copics, and glitter gel pens. I dug deep in my stash for the birthday tag and the other bits and bobs. Hope you can join us at CCC this fortnight.